I spend a fair amount of time reading about fishing—in books and online—and, as I’ve noted elsewhere on this site, I’m weary of the preponderance of trout writing and trout photos. As I’ve also said, I am a big fan of trout and trout fishing. I just don’t like to see fishing limited to a few types of fish. I’ve wondered if the many bloggers and authors posting amazing trout photos have shots of other fish that they’re not posting in the belief that no one is interested. Then, last month, the guys at False Casts and Flat Tires wrote about the largescale suckers they caught in Montana. The date: Feb. 13, 2012. The place: the Roaring Fork River, near Glenwood Springs, CO. 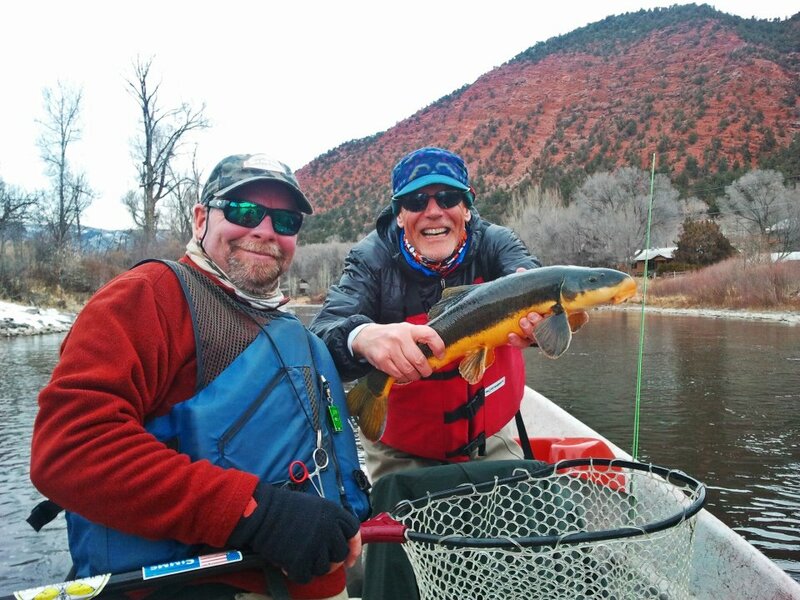 The fortunate angler is Tom Gart and the guide is Kyle Holt of Taylor Creek Fly Shops. The fly: a #18 BH pheasant tail. 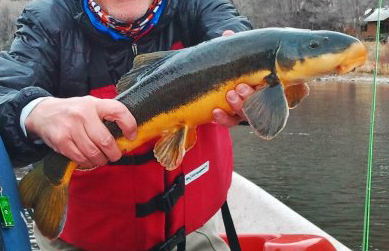 The fish: a Flannelmouth Sucker (Catostomus latipinnis). It is good to see such a healthy-looking specimen, as their range and numbers have decreased due to loss of suitable habitat and competition with introduced species. They are not listed in Colorado, but Nevada lists the flannelmouth as a sensitive species and Utah lists it as being of special concern due to declining population. The fish is a native, of course, not exotic, unless by exotic he means “impressive, out of the ordinary, surprising and awe-inspiring.” It is one heck of a sucker. No word on how Mr. Gart felt about this catch, but I hope he was suitably impressed with himself. Taylor Creek’s Kirk Webb reports that they catch quite a few suckers. He wrote, “There’s plenty around here….and we all love them as much as the trout.” That’s the kind of attitude I like! If I could afford it, I’d buy a plane ticket and book a trip right now for flannelmouths, blueheads (and an occasional trout). Thanks to Taylor Creek Fly Shops for permission to post their photo. I asked them to let me know if they find more shots like this. If they do, I’ll post them here. In the meantime, check out their photos on facebook–there are even other sucker photos among them. Others: https://www.facebook.com/taylorcreek.flyshops/photos/a.590287071113977/590295201113164, https://www.facebook.com/taylorcreek.flyshops/photos/a.590287071113977/590300694445948/, https://www.facebook.com/taylorcreek.flyshops/photos/a.590287061113978/590299327779418/, https://www.facebook.com/taylorcreek.flyshops/photos/a.590287061113978/590298027779548/, https://www.facebook.com/taylorcreek.flyshops/photos/a.590287061113978/590292697780081/. Tagged Colorado, flannelmouth, flyfishing, latipinnis, nymph, respect, suckers, trout. Hi, my name is John Kelley, I’m a guide for Rainbow lodge on the San Juan river in Navajo Dam, New Mexico. I live in Aztec, NM, about 18 minutes from quality waters. Here in Aztec, my guide friends and eye catch flannel mouths all the time!! They’re fantastic! Considering the fact that they are native, we all employ catch and release of these beautiful fish which are abundant in the Animas that flows south right through town out of Durango, Co. They’re a thrill to fight, and about 3 minutes from my house so when time is of the essence, we wader up and fly fish for them right in the middle of town! Tonight I caught 4 on a size 14 red hook with a flashback betis dropshot, using a 9’5 weight for our 20 inch rainbows on the San Juan. I see them in schools of 10, 20, even 30 sucker’s ranging in size from 14 inches to 30 inches!! I’ve got dozens of pics like the ones above. Happy to share and let you know everything we’ve figure out!! Just let me know!